Mark Handforth, Dr. Pepper , 2017. Aluminum, stainless steel, enamel paint, fluorescent aquarium lamps, color gels and waterproof light fixtures. Collection of Institute of Contemporary Art, Miami. Museum Purchase with funds provided by the John S. And James L. Knight Foundation. Photo: Silvia Ros. The Institute of Contemporary Art welcomes Miami-based artist Mark Handforth to ICA Speaks. A renowned artist and sculptor whose work features prominently in the museum’s permanent collection, Handforth will discuss recent work including a new sculpture commissioned for ICA Miami’s forthcoming building opening December 1. In his sculptural installations, Mark Handforth transplants familiar objects into unfamiliar surroundings in order to reveal something new about the ways in which these things exist and function in our everyday lives. Born in Hong Kong, raised in England, and based in Miami since 1992, Handforth revels in the skewed perspectives and unintended consequences that result from cultural migration and displacement. 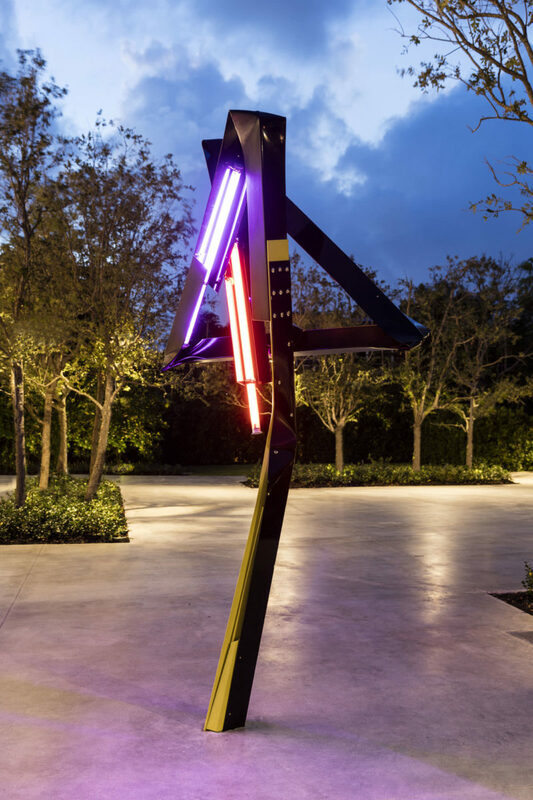 In the Hammer’s Vault Gallery, Handforth will present several recent sculptures, including a street lamppost that appears to have been stretched out and folded in upon itself, and a fluorescent light sculpture. Mark Handforth (b. 1969, Hong Kong) is an artist and sculptor whose work has appeared in a number of solo and group shows in Europe and the United States. He has had solo exhibitions at Galleria Franco Noero, Turin, Italy (2002); Gavin Brown’s Enterprise, New York (2002); and the Museum of Contemporary Art, North Miami (1996). He has participated in group exhibitions at Charlottenborg Exhibition Hall, Copenhagen (2002); Johanniterbrucke, Basel (2001); the Museum of Contemporary Art, North Miami (2000, 1999); and Gavin Brown’s Enterprise (1998). Handforth currently lives and works in Miami, FL.